A new look and a 40 year maintenance free roof. 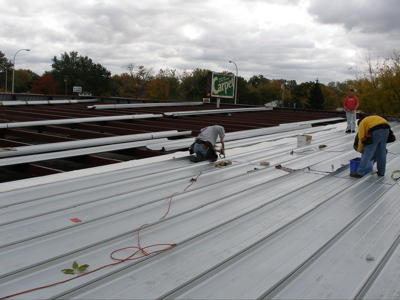 Installing a sloped metal roof over a flat roof. 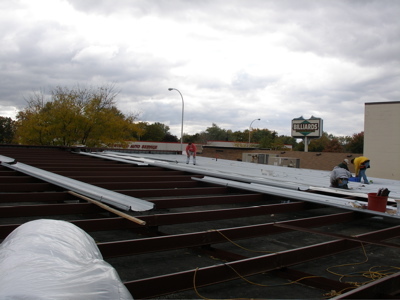 When installing a new sloped metal roof over an existing flat roof the support structure is installed over the top of the flat roof. When using a standing seam sloped metal roof the new roof pitch can be as low as 1/4:12. 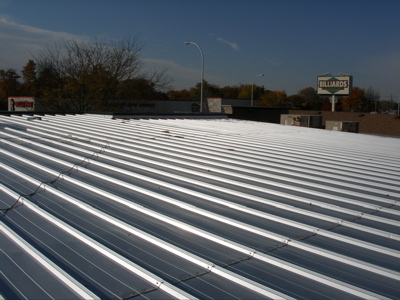 A standing seam roof is a hidden fastener system roof with no exposed fasteners. This new roof should last over 40 years. We are currently seeing roof from the 70's that are still in good shape, and the new galvanizing processes today are far superior to what was used back then. 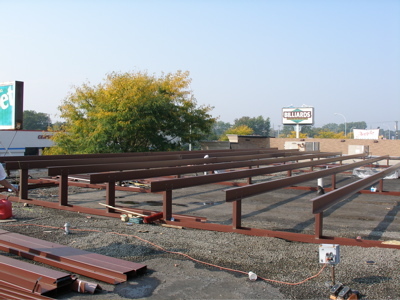 At the completion of the project a mansard can be installed to modernize the look of the building and hide the newly installed sloped metal roof over the old existing flat roof.